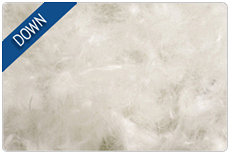 Hollow Fibre is a synthetic man made material, consisting of hollow strands that allow air to pass through, trapping it within the strand producing loft. This fibre creates a plump cushion with a medium to firm feel, suitable for all suite, scatter and bolster cushions. 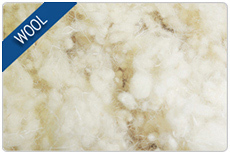 Hollow fibre is great for indoor and also outdoor use as it inhibits mould growth and is also an anti-allergy filling which is similar in density and cost to feather, making it a good alternative for those suffering from allergies. 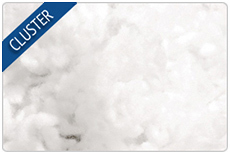 Micro cluster fibre is a luxury synthetic filling, made up of small ball clusters. The small balls provide even distribution around the cushion achieving a luxuriously plump finish, good recovery and a soft to medium feel. Suitable for interior and exterior suite bolster and scatter cushions, Micro cluster fibre is an anti-allergy filling and makes a good alternative to feather & down for people suffering with allergies as both fillings share a similar density feel. 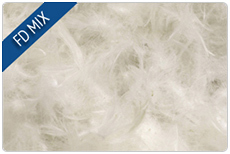 Duck Feathers are our most popular filling consisting of small feathers with a slight natural curl which act like a spring aiding in support, recovery and comfort, producing cushions with a medium-firm sink in feel. 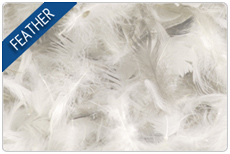 Feather is a cost effective filling and is suitable for all suite, scatter and bolster cushions. Wool is a new natural filling choice that we are very proud to offer as we are one of the only companies certified to use wool in cushions for furniture. Wool makes excellent suite, scatter and bolster cushions that are light with a firm stable feel, and easily recover and push back out after use. Wool is a mid-range priced filling but is worth the upgrade if you prefer a firmer feeling cushion. Wool is naturally anti-allergy, resistant to dust mites and bacteria and is considered to be the most eco-friendly and sustainable filling. Feather & down filling is a natural luxury combination filling consisting of 85% small duck feathers and 15% pure duck down. This is our entry level luxury filling suitable for all suite, scatter and bolster cushions, providing softer, plumper cushions than standard duck feather. Feather & Down offers good recovery due to the down, but still offers the added support that duck feather has to offer. Down & feather is our high end luxury natural filling made up of an even split combination of 50% pure duck down and 50% duck feathers. Making super soft plump suite, scatter and bolster cushions and particularly suited to back cushions due to the fillings superior softness. This filling offers an extra level of comfort and support. Pure duck down is the ultimate luxury loose filling, producing an extreme softness unachievable by any other filling and is known to be the most luxurious filling to have in cushions. 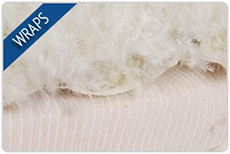 Made up of the soft cluster feathers which lie beneath the quilled exterior feathers, pure down produces light cushions that you can sink into and achieves a superior plump finish, especially suited to scatter, bolster and suite back cushions but not however for seat cushions as down is so soft it is unable to produce enough support to sit on. Soft Foam is suitable for all indoor and outdoor back cushions. Providing a more defined shape than loose fillings, soft foam backs offer minimal maintenance and excellent recovery whilst still being soft and supportive. A perfect combination when combined with foam seats and can be supplied covered in a dacron wadding to create a luxurious plump finish. Our medium foam inserts can be cut to any size to slot straight into existing cushion covers and is provided covered in a dacron wadding which pushes out the covers to create a plump finish similar to that of a loose filling but with minimal maintenance. A high density foam suitable for sofa, chair and conservatory seat cushions, offering good support and recovery with a luxury soft to medium feel. 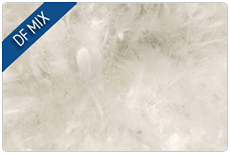 Our supreme foam is a luxury low maintenance filling that keeps its shape and has a long life span. Supplied with a dacron wadding covering for a plump finish, this filling offers added luxury and comfort. Our firm foam inserts are cut to size and can be slotted straight into an area or your cushion covers. Firm foam provides a firm stable base giving increased support and excellent recovery, maintaining its shape for years. Suitable only for firm based seating such as window, stools and bench seats and also outdoor seating applications due to its durability and resistance to climate conditions. We can provide firm foam covered in a dacron wadding which rounds off the corners and creates a plump look for those wanting to achieve a more luxurious finish. Our luxury wrap cushions are the ultimate high-end combination, flexible filling option. Consisting of a foam insert in a choice of density's, firm or medium for seats and soft density for backs. The foam is then wrapped in a channelled duvet, which can be filled in your choice of natural or synthetic loose fillings. Wraps offer the optimum in support, comfort, durability and luxury, combining all the benefits of both foam and loose fillings with minimal maintenance. Our wraps are suitable for all indoor seating applications and give you the opportunity to create a luxury cushion filling that is completely tailored to your own comfort and preference.